It is no secret that e-commerce is now one of the fastest growing sectors of the economy. This has been buoyed by consumers who are more comfortable with technological devices like smartphones and tablets, which are becoming more important portals for online sales. In an increasing digital and wireless world, e-commerce transactions are becoming the norm rather than the exception. This is also dramatically changing purchasing behavior; more consumers are researching products online, comparing brands and prices, and seeking out the reviews of previous customers. This intense shift to online stores has forced most merchants to expand their operations into the digital realm. Those retailers who fail to take their enterprises online are almost certainly doomed to obsolescence as their competitors leverage online sales into greater market share. There is a wide consensus that ecommerce will not only expand over the coming years, but that growth will be at a breakneck pace as more companies divert resources to boosting online operations. Retailers who fail to establish an online store front will soon be operating at a severe disadvantage. The fashion industry continues to experience outsized growth in the e-commerce market. More consumers are shopping and making purchases online as the purchasing options, apparel selections and the ease of returns increase. This increase in online fashion shopping has been bolstered by robust marketing initiatives sponsored by the major retailers. These savvy marketing campaigns have quelled the fear that fashion purchases made online may not be as satisfying as those from a brick-and-mortar outlet. i95Dev has recognized this upward trend in the fashion e-commerce market and developed a variety of solutions for retailers that include powerful analytics about consumer buying patterns, market sales trends, and other key performance indicators. With these tools retailers can be confident that their online business is as competitive as any enterprise on the market. The sporting goods industry is a high volume one that requires intensive inventory applications to monitor product stocks, variants and prices. With i95Dev’s customized e-commerce solutions for Warehouse Management Systems, retailers will be utilizing market leading applications that provide real time information to their online storefronts. Our e-commerce solutions also include rich marketing and promotional tools designed to reach target consumer groups and drive them through an enterprise’s sales funnel. With the powerful reporting tools that our e-commerce solutions feature, any retailer can know exactly how well their company is performing both online and in-store. The food and beverage e-commerce industry is a marketing dependent sector which benefits greatly from manufacturer as well as retailer promotion. Using tools developed by i95Dev, the e-commerce marketing platforms that food and beverage companies use to attract online consumers can become even more effective. Our e-commerce solutions utilize the latest methodologies to reach the widest audience possible, thereby raising brand awareness and extending market reach. The travel and hospitality industries have long been dependent upon technologically rich applications to connect with consumers. Consumers seeking the most ideal vacationing, travel and accommodation options have utilized the internet to research available deals. This has made the travel and hospitality e-commerce markets one of the most competitive and challenging of any business sector, but by adopting i95Dev’s e-commerce solutions, travel and hospitality companies can offer the right combination of deals, gift offers, and coupons to attract a vast array of customers. With these powerful e-commerce tools, travel and hospitality companies can cater to consumers seeking cut-rate bargains or the highest end luxury accommodations. Please follow our blog in September as we detail how i95Dev’s e-commerce solutions can positively impact the retailers in each of these challenging industries. As we examine the fashion, sporting goods, food and beverage, and travel and hospitality industries in turn, we will share exactly how our powerful e-commerce solutions can provide the analytical tools, market information, and competitor evaluations that can provide the competitive advantages necessary to find success in a crowded market. 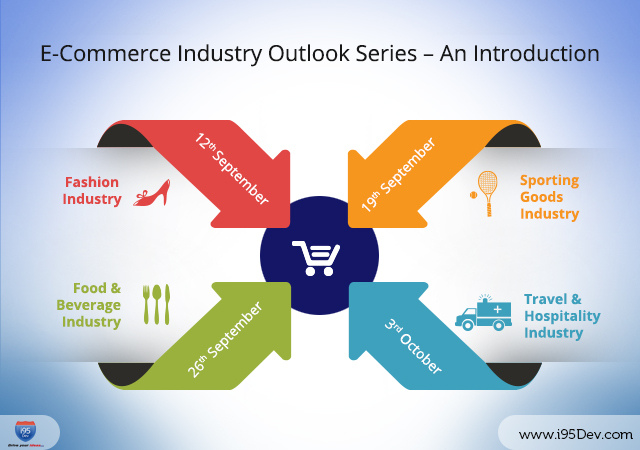 Please join us for this intriguing examination of these rapidly growing e-commerce sectors. i95Dev is one of the business community’s most trusted e-commerce solution providers offering products for a wide range of industries and enterprises. To learn more about how i95Dev can improve your company’s efficiency, agility and competitiveness, please contact us by email at info@i95dev.com or call us at 301.760.7499.